Going Paleo is the only book you'll need to transform the way you eat - and change the way you look and feel - for good. This comprehensive and user-friendly guide shows you both why to go paleo and how to go paleo, with over 80 essential recipes to get you started. 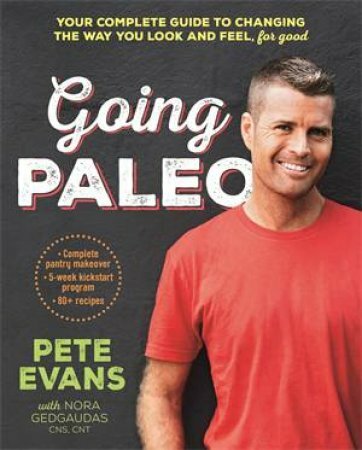 Paleo expert and bestselling US author Nora Gedgaudas explains the why of going paleo and Pete Evans explains the how, with a run-down on the foods that have to go and what to replace them with; a detailed guide to setting up your paleo kitchen; and a 10-week kickstart eating plan to help you get started. The recipes in Going Paleo are delicious, quick and highly nourishing. Breakfasts include Kale and Sweet Potato Tortilla and Paleo Parfait with Coconut Cream, while dinner might be Crispy-skinned Salmon with Celeriac Remoulade, Cauliflower Fried Rice with Bacon or a simple Lamb Moussaka. There are chapters for snacks and drinks and heaps of veggies and salads - try Raw Rainbow Pad Thai or Sauerkraut with Dill and Juniper Berries. There is also a chapter for the basics - Make your own fermented mustard or tomato ketchup, or cook up a big pot of chicken bone broth to use in various recipes throughout the week. Going Paleo is for everyone who is interested in good health and eating real food - food that our ancestors would have recognised, that is nutrient dense and that provides our body with the right kind of fuel to perform at its absolute best.